Emergency Water Tanks – The ultimate in readiness! The devastation we have witnessed in the Canterbury and Wellington region, along with significant emergency events such as flooding has highlighted to many how easy it is to take for granted the luxury of a clean potable water supply. Peter Walker of the Hutt Valley Emergency Management Office, has been working on a project over the course of 2010 to manage this very problem. “It is no secret that the Wellington fault is a busy one and therefore we feel it is prudent to manage the access to a reliable emergency water supply for the public in a significant earthquake event” says Mr Walker. 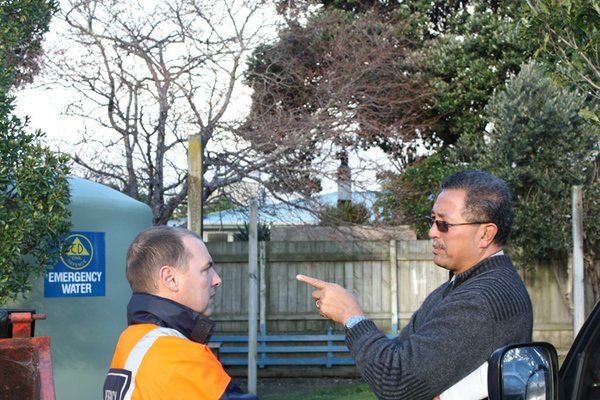 During the course of 2010, Peter managed a project to install 5,500 litre Devan water tanks into 26 schools throughout the Hutt Valley. The tanks are isolated from everyday use and labelled as a ‘Civil Defence’ tank. The tanks are filled by the local New Zealand Fire Service, and subsequently serviced once per year to ensure the water is kept in top condition and ready for use at any time. Although using tankers to move water around to areas of need in emergency events accommodates the immediate requirement for emergency water, these tankers are held up on-site until the need has been met or until the water has been exhausted. By having tanks located at schools throughout a district, tankers can be put to use ferrying water around making sure the tanks have water available and are not held up on-site for longer than necessary. Another bonus is that should any emergency event cut off road access to certain areas, there is a supply readily available for the short term. The model used by the Hutt Valley team can be applied all around the Country at a reasonable cost through the cooperation of schools and suppliers. In recognition of the contribution being made to the wellbeing of the community Devan supply all tanks for this type of application at the lowest possible wholesale pricing level. Having witnessed the queues of people on the news after the Christchurch event, and fielding calls for weeks to come from people desperate to get a water supply reinstated has made Devan very aware of the plight some people end up in. Devan donated all available stock to various causes to get schools open and to provide tanker drop off points around the city. We did all we could to help, but it never feels like enough. By providing our experience and expertise to other councils, Devan can assist a town, city or region become better prepared for this type of emergency situation.